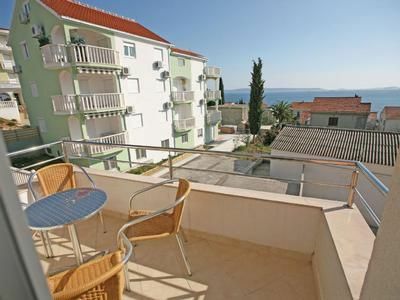 Situated on the peninsula of Seget Vranjica, apartments Kairos offer self-catering accommodations with free Wi-Fi access. Featuring a shared patio with BBQ facilities, apartments Kairos are a 3-minute walk from the beach. This complex offers accommodation in studio, one-bedroom and two-bedroom apartments all with private balconies with sea view. It can accommodate up to 50 people. Groups are welcome. All the apartments feature a stunning sea view and are equipped with a flat-screen TV and a kitchen with refrigerator, kettle and coffee machine. The private bathroom comes with shower. All apartments also come fully furnished with bed linen and towels also provided. Trogir is a 10-minute driving from apartments Kairos and it can be reached even by boat, whose stop is only 300 m from the house. Intermediate cleaning: per object and day Costs amounting to 10 EUR (optional). Pet: per object and day Costs amounting to 5 EUR (optional). Seget Vranjica is a small peninsula located just 5 km north from Trogir. In the village there are some restaurant and shops. Only 100 m from the house it starts a seaside promenade of 4 km. At 400 m from the house there is a taxi boat which is driving every hour to Trogir.